Join us for a 3-Month advanced online course exploring sacred vocal sounding with Vickie Dodd. For this advanced-level course, Vickie will present her teachings through the lens of the human chakra energy system. Each 2-hour class will focus on a different chakra, illuminating the energy centers’ connection to the glands of the physical body. Through focusing on the aspects and attributes each chakra governs, we will engage in investigative self-inquiry, utilizing the sound of our own voices together with the vibration of color and light. We will gather together in a virtual sacred circle, learning and sharing powerful tools to cultivate self-love in these seemingly tumultuous times of change. 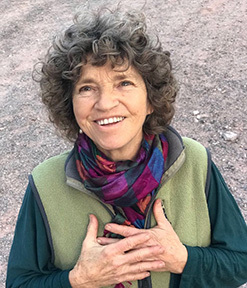 Lead by Sound Pioneer Vickie Dodd of Sacred SoundWorks, and hosted by Joule LAdara of Sounding Circles, the course meets live on the Zoom online platform for 6 two-hour sessions on alternating Saturdays. Each participant will also receive a one-on-one session with Vickie as well as regular email and phone access to her throughout the duration of the course. Please contact joule@soundingcircles.com to apply and receive pricing and details.